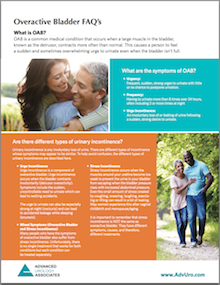 OAB is a common medical condition that occurs when a large muscle in the bladder, known as the detrusor, contracts more often than normal. This causes a person to feel a sudden and sometimes overwhelming urge to urinate even when the bladder isn’t full. Frequent, sudden, strong urges to urinate with little or no chance to postpone urination. An involuntary loss of or leaking of urine following a sudden, strong desire to urinate. Take a quick survey to see if you may have an overactive bladder. Urge incontinence is a component of overactive bladder. Urge incontinence occurs when the bladder contracts involuntarily (detrusor overactivity). Symptoms include the sudden, uncontrollable need to urinate which can lead to wetting accidents.The urge to urinate can also be especially strong at night (nocturia) and can lead to accidental leakage while sleeping (enuresis). Many people who have the symptoms of overactive bladder also suffer from stress incontinence. Unfortunately, there is no single treatment that works for both conditions but each condition can be treated separately. Learn more about stress incontinence symptoms and treatment options.